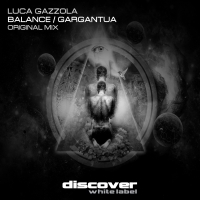 Next up on Discover White is a banging two track excursion from Luca Gazzola. Starting with Balance, its tough and edgy with clever key changes and shifts in pace that hook you in. Pace, drive and a cool as you like acidic leadline.together with a powerful breakdown with ethereal undertones to balance the mayhem. Gargantua has a heavier psy influence dictated by the rolling bass peppered with stabs, vox fx and the occasional trance riff for good measure. Quality stuff from Luca Gazzola. 'Balance / Gargantua' is available now from Beatport and iTunes.